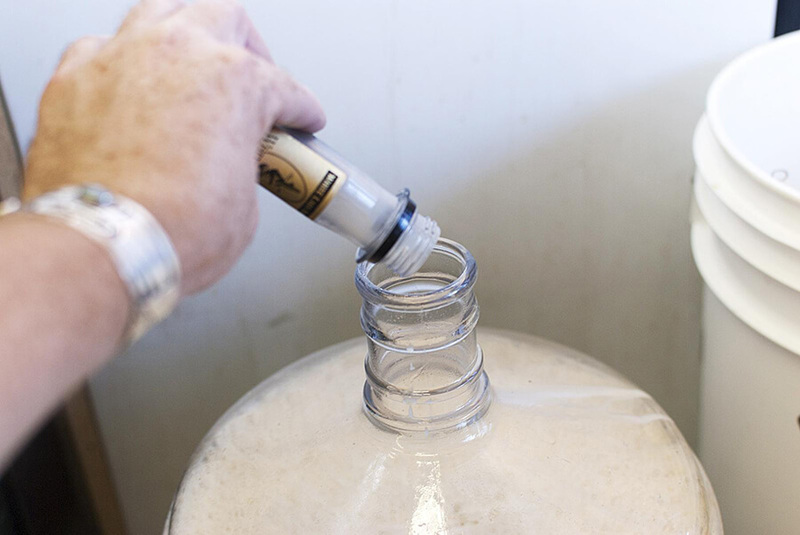 The adding of yeast to the wort is called “pitching” and is the next (and final) step in this phase of making beer. Sprinkle the yeast on the top of the wort. Gently shake the pouch or vial, to make sure all the yeast is in suspension in the liquid. If you have a smack pack, cut open the pouch with a sanitized pair of scissors and pour it into your fermenter. If it’s in a test tube, slowly and carefully unscrew the top and pour it in. After the yeast solution has been poured into your fermenter, you should replace the airlock and fill it to the marking line with water and sanitizer or cheap vodka.